The decline of the high street is a ‘hot topic’ at the moment, but the other side of this story is technological change – the growth in the logistics sector – and this is receiving much less attention. As with the changes to city centre shopping, the increased demand for logistics is playing out very differently across our cities. Both now and in the longer term, logistics raises choices for cities, and the risk of some cities’ over-reliance on warehouse jobs is a growing concern. The same innovations that are causing the decline of our high streets, especially online shopping, are also causing a boom in deliveries and the warehouses they need. 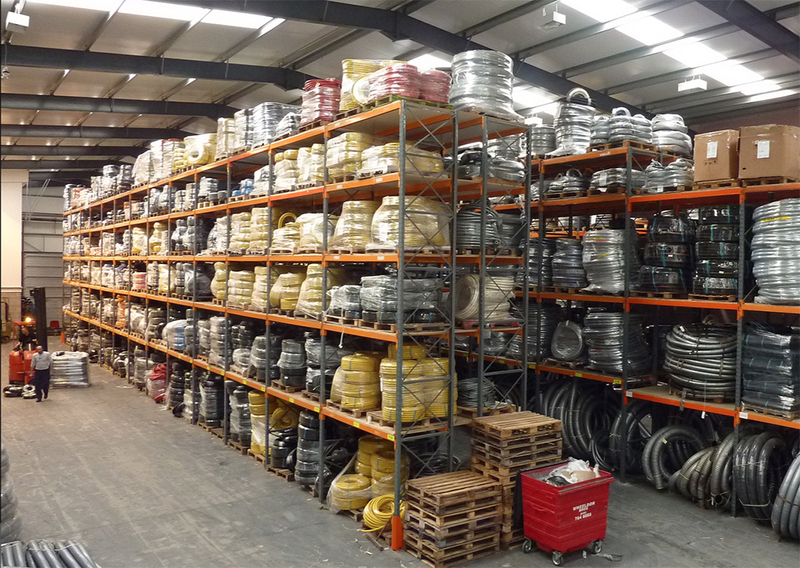 But as interviewees for our new report Building Blocks explained, two kinds of warehouses are needed – ‘big sheds’ on the outskirts of cities close to motorway junctions that serve as distribution centres for the national market, and small sites nestled inside cities to organise ‘last mile’ deliveries from the depot to the doorstep. While ‘last mile’ logistics space is in short supply in the big cities, especially London, the ‘big sheds’ are taking up enormous amounts of commercial space in some cities – 27 per cent of Milton Keynes’ suburban commercial space and 35 per cent of Northampton’s are warehouses. 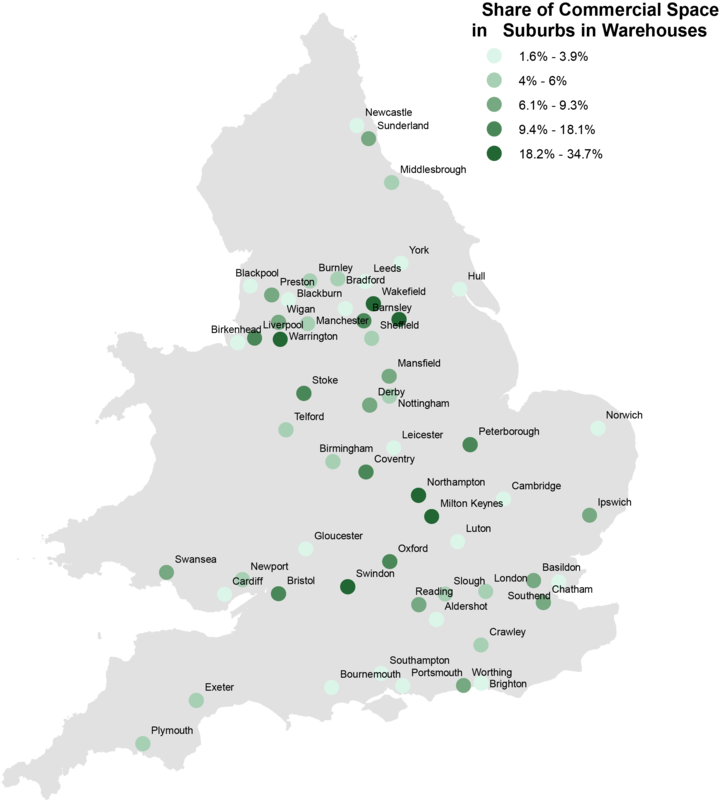 Although some stronger cities, like Warrington and Bristol, have large logistics sectors due to their good infrastructure, most cities with a large logistics presence tend to have weaker economies like Doncaster and Peterborough. The private sector investment and jobs that come with logistics have been welcomed in many cities, and cities are right to free up land to meet the demand for logistics space. But the jobs created by logistics are typically low-skilled and low-paid. In these weaker economies, logistics may be able to provide much-needed employment, but not better-paid or more productive jobs. Cities may decide that this trade-off is worth it, at least in the medium term. But doing so without driving growth elsewhere in the local economy risks replicating patterns of low-skilled work that have left cities vulnerable to economic change. This is already apparent with signs of growing automation in the logistics sector. Eerie videos of robotic Ocado warehouses and delivery drones that crash on their first test flight may not yet be representative, but logistics typically creates the kind of routine jobs which have been exposed to technology change in the past – and are likely to be exposed again in future. 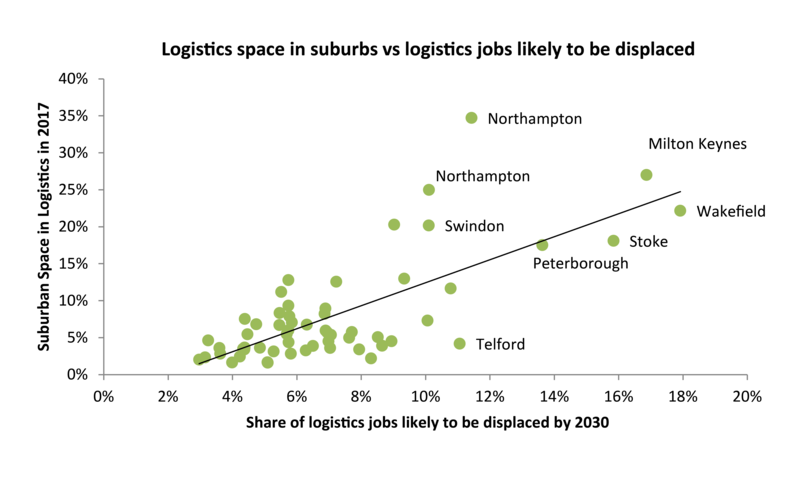 On the city level, the places most affected will be those with the most logistics jobs. These mostly correspond to the cities above which are also seeing the most demand for logistics space. The graph below shows the share of commercial space in suburbs in logistics plotted against the share of jobs to be displaced by 2030 that are in logistics. While the supply of logistics space will probably grow in the long term, the number of logistics jobs probably won’t. For these cities, logistics jobs aren’t an alternative to disappearing retail jobs but are at risk of vanishing themselves. Over the longer term, the prospects for logistics employment resemble that of manufacturing fifty years ago. While manufacturing is more productive than ever, the workforce is now made up of a smaller number of higher-skilled manufacturing jobs. As jobs such as lathe operators and assembly workers have declined and been replaced in manufacturing by fewer but higher-paid programmers and engineers, warehouse operatives and delivery drivers are likely to be replaced by robotics maintenance workers and (maybe) drone pilots. Worryingly, many of the cities with lots of logistics jobs vulnerable to displacement also relied in the past on low-skilled manufacturing jobs that have now disappeared. For cities in this position, the goal has to be re-inventing the local economy with a more skilled and productive workforce. This means attracting high-skilled exporters, who prize city centre locations for their knowledge spillovers and agglomeration economies. As Milton Keynes and Bristol show, this is compatible with also meeting today’s demand for logistics space and warehouse work – but cities will need to think about what happens tomorrow if logistics is to deliver.